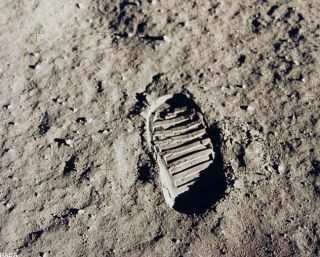 Apollo 11 astronaut Edwin Aldrin photographed this iconic photo, a view of his footprint in the lunar soil, as part of an experiment to study the nature of lunar dust and the effects of pressure on the surface during the historic first manned moon landing in July 1969. The historic launch of the Apollo 11 mission carried three astronauts toward the moon. Two of them would set foot on the lunar surface for the first time in human history as millions of people around the world followed their steps on television. Col. Edwin Eugene "Buzz" Aldrin, 39, was the first astronaut with a doctorate to fly in space. Born Jan. 20, 1930, in New Jersey, Aldrin piloted Gemini 12, taking a two-hour, twenty-minute walk in space to demonstrate that an astronaut could work efficiently outside of the vehicle. For Apollo 11, he served as the lunar module pilot. Mission planners at NASA studied the lunar surface for two years, searching for the best place to make the historic landing. Using high-resolution photographs taken by the Lunar Orbiter satellite and close-up photographs taken by the Surveyor spacecraft, they narrowed the initial thirty sites down to three. Influencing factors included the number of craters and boulders, few high cliffs or hills, and a relatively flat surface. The amount of sunlight was also a factor in determining the best time to land on the lunar surface. Apollo 11 launched from Kennedy Space Center in Florida at 9:32 a.m. EDT on July 16, 1969. While in flight, the crew made two televised broadcasts from the interior of the ship, and a third transmission as they drew closer to the moon, revealing the lunar surface and the intended approach path. On July 20, Armstrong and Aldrin entered the lunar module, nicknamed the "Eagle" and separated from the Command Service Module — the "Columbia" — headed toward the lunar surface. The lunar module touched down on the moon's Sea of Tranquility, a large basaltic region, at 4:17 p.m. EDT. Armstrong notified Houston with the historic words, "Houston, Tranquility Base here. The Eagle has landed." For the first two hours, Armstrong and Aldrin checked all of the systems, configured the lunar module for the stay on the moon, and ate. They decided to skip the scheduled four-hour rest to explore the surface. Memorial medallions with the names of the three astronauts who perished in the Apollo 1 fire and two cosmonauts who were also deceased, including the first man in space, Yuri Gagarin, remained after the astronauts left, as did a one-and-a-half-inch silicon disk with goodwill messages from 73 countries, and as the names of congressional and NASA leaders. Armstrong spent a little over two and a half hours outside of the Eagle. The astronauts traveled a total distance of about 3,300 feet (1 kilometer) as they walked around, traveling as far as 200 feet (60 meters) from the module to visit a large crater. They collected 47.51 lbs. (21.55 kilograms) of samples from the moon, and reported that mobility on the moon was easier than anticipated. Apollo 11 astronauts, still in their quarantine van, are greeted by their wives upon arrival at Ellington Air Force Base on July 27, 1969. The team splashed down in the Pacific Ocean at 12:50 p.m. EDT on July 24, only a few miles from the recovery ship, the U.S.S. Hornet. After donning biological isolation garments, the crew left the Columbia and climbed into a rubber boat, where they were rubbed down with iodine in an effort to stem potential contamination. They traveled by helicopter to a Mobile Quarantine Facility aboard the ship before being taken to Houston. They remained in quarantine until Aug. 10, having completed the national goal set by President John F. Kennedy in 1961, to perform a crewed lunar landing and return to Earth. The Apollo 11 mission remains widely celebrated as it approaches its 50th anniversary in 2019. The U.S. mint is already preparing special coins for the celebration. A 2016 initiative to recreate Apollo 11's flight plan for the public soared past its Kickstarter goal. The Smithsonian Institution is redoing its moon gallery at the National Air and Space Museum (NASM) in Washington, D.C., for a 2021 opening. Meanwhile, the newly restored Columbia spacecraft is on tour with stops in Houston, St. Louis, Pittsburgh and Seattle. It's the first time Columbia has been outside the Smithsonian since 1971. In July 2009, the National Air and Space Museum hosted a gala for the 40th anniversary, including speeches by the three crewmembers of Apollo 11. In an afternoon session where Collins, Aldrin and Apollo 12 astronaut Alan Bean offered autographs, the line of people quickly stretched across the entire museum's floor. Armstrong, 82, died on Aug. 25, 2012, from complications following cardiovascular procedures. A public memorial service was held Sept. 13 at Washington National Cathedral, and Armstrong was buried at sea the next day. In 2015, NASM announced that Armstrong's widow (Carol Armstrong) had found a purse full of lunar artifacts among Armstrong's belongings, which she donated to the museum. NASA's Lunar Reconnaissance Orbiter imaged the Apollo 11 landing site from space in 2012 and spotted the astronauts' tracks, some of the experiments, a discarded camera and of course, the descent stage of the Eagle lunar module. A 3-D view of the site (based on this data) was generated in 2014. A lunar sample bag from Apollo 11 generated a legal dispute after it was sold at a Texas auction in 2015, held on behalf of the U.S. Marshals Service. Illinois buyer Nancy Carlson bought the bag for $995. The U.S. government petitioned courts to return the lunar sample bag to NASA and undo the sale, but Carlson was ruled the legal owner in 2016. NASA's historic Apollo 11 moon mission landed the first astronauts on the lunar surface on July 20, 1969. See how the mission worked in this Space.com infographic. Editor's note: This article was updated on Dec. 18 to correct Armstrong's quote about Tranquility Base.